L 26″ (66 cm) W 40″ (102 cm). Description: Sexes similar. Adult mainly blackish, with dull yellow throat pouch that tapers to a sharp point behind bill. Immature dull gray-brown above, somewhat paler below. Habitat: Deeper marshes, lakes, rivers, and reservoirs. Where in Nebraska: Rare casual summer visitor statewide. No breeding records for Nebraska. 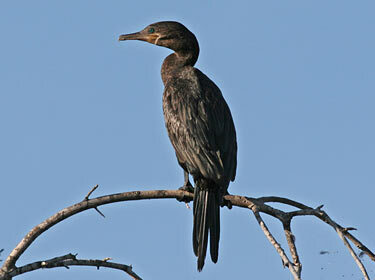 Field Notes: Scan groups of Double-crested cormorants for possible Neotropic Cormorants during May-October. 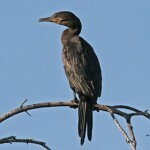 Fun Facts: Neotropic Cormorants often fish cooperatively by walking in a line in swift water and herding fish to then dive after. 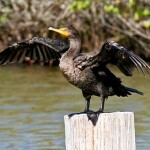 Additional Information: Formally known as Olivaceous Cormorant.